A unique rhodium plated 9ct white gold eternity ring featuring the customer's own brilliant cut diamonds, one 4.5mm, two 4mm and two 3mm diamonds totalling 0.86cts. 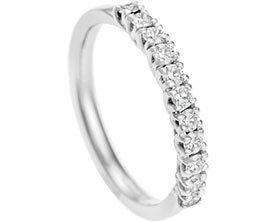 The diamonds are set edge to edge, with a 3mm band with curved D shape profile. To finish the ring has been polished to a high shine.